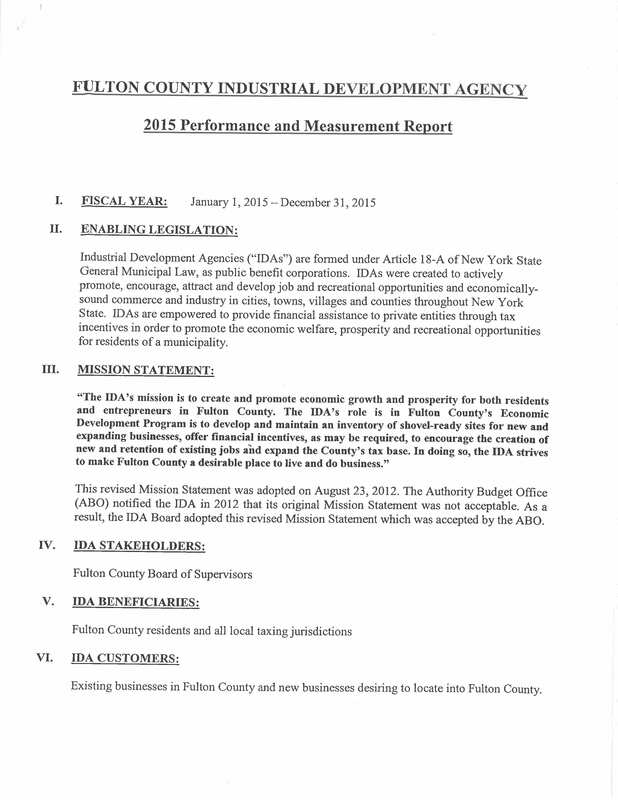 Industrial Development Agencies (“IDA’s”) are formed under Article 18-A of New York State General Municipal Law, as public benefit corporations. IDA’s were created to actively promote, encourage, attract and develop job and recreational opportunities and economically sound commerce and industry in cities, towns, villages and counties throughout New York State. IDA’s are empowered to provide financial assistance to private entities through tax incentives in order to promote the economic welfare, prosperity and recreational opportunities for residents of a municipality. This revised Mission Statement was adopted on August 23, 2012. The Authority Budget Office (ABO) notified the IDA in 2012 that its original Mission Statement was not acceptable. As a result, the IDA Board adopted this revised Mission Statement which was accepted by the ABO. Existing businesses in Fulton County and new businesses desiring to locate into Fulton County. Comply with the Public Authorities Accountability Act. Assist businesses in creating and retaining jobs by providing financial assistance. Identify additional sites for business development. Have IDA Board members acknowledged that they have read and understood the IDA’s Mission Statement? Who has the power to appoint the management of the IDA? If the IDA Board appoints management, is there a policy the IDA Board follows when appointing management? Briefly describe the role of the Board and management in the implementation of the Mission Statement. The IDA Board provides strategic input, guidance and oversight of the IDA’s mission, adopts policies, adopts a budget, appoints an Executive Director, Chief Financial Officer, Counsel and Auditor. The Board provides direct oversight of its Executive Director. The Executive Director has the responsibility for the day-to-day operations of the IDA, collaborates with the IDA Board in strategic planning and implements policies and programs established to achieve the IDA’s mission. Has the IDA Board acknowledged that they have read and understood the responses to each of these questions?